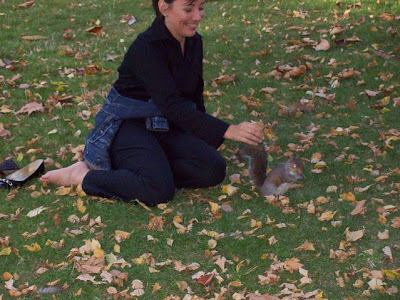 But one of the wonders that Autumn gives us, are its magnificent colors we see in our parks and some hungry squirrel. 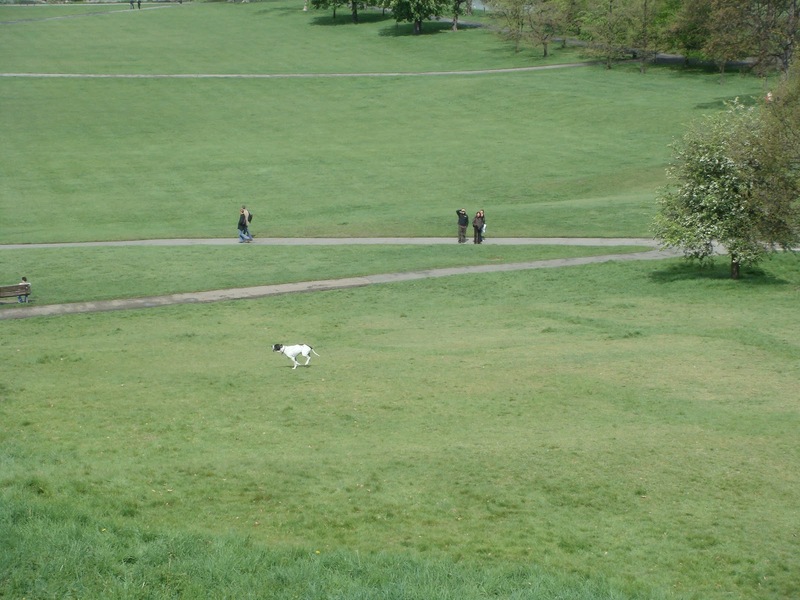 Some brave people challenge the weather and enjoy their lunch break, in front of a fantastic view. 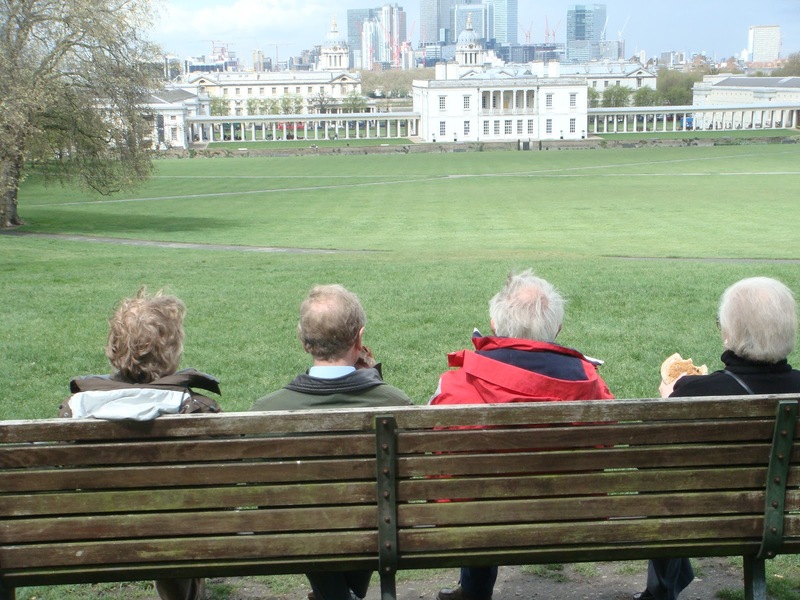 A visit to Greenwich is well worth because its important museums, the pictoresque market, the countless of unique shops and lots of café and restaurants. Sprinkle the duck with a mix of sea salt and crushed sage, thyme and rosemary. Flatten the legs and do some cut on the skin, to make sure that the meat will absorbe all the nice flavours. Preheat a pan with some olive oil, a clove garlic and rosemary add the duck and cook until browns on both sides at medium\high heat. 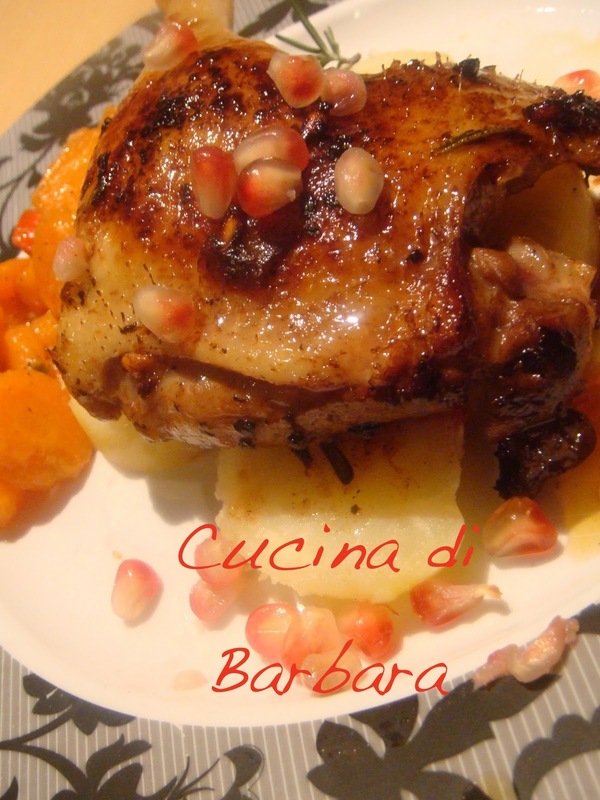 Transfer the duck in the oven with the pomegranate juice on top for 20 minutes at 180°C. Here they are, crispy outside and fluffy inside. 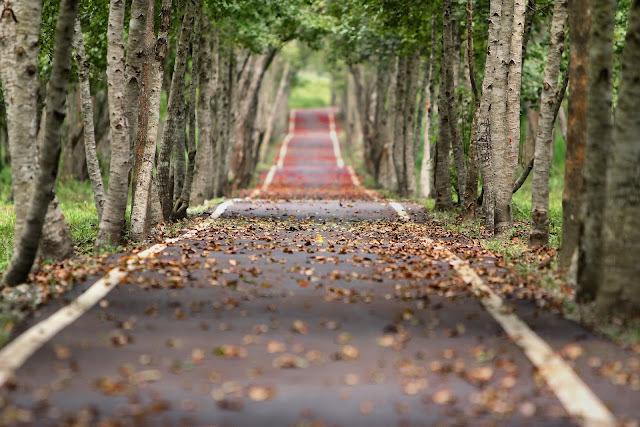 L'Autunno è tornato inesorabile anche quest'anno e fra qualche giorno dovremo anche spostare le lancette. Si trovano ancora persone che si fermano a fare la pausa pranzo infischiandosene del meteo... Imperturbabilità inglese! 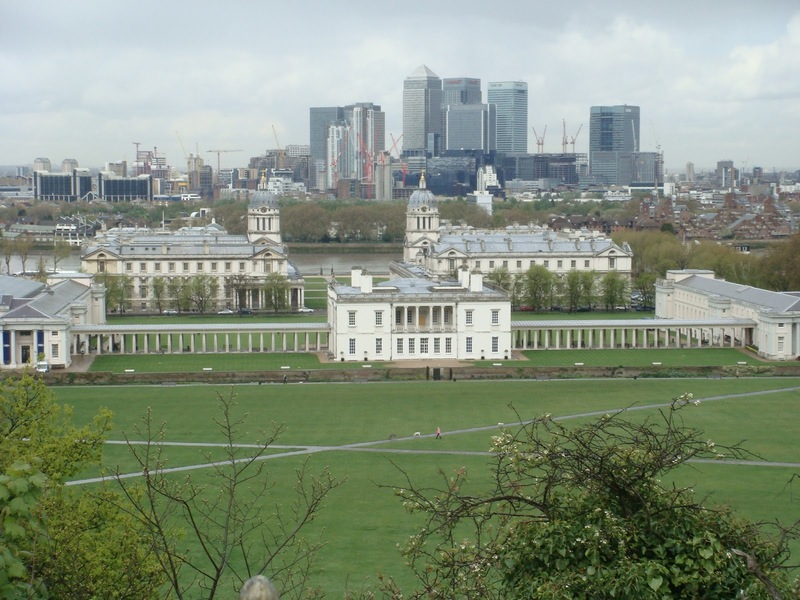 Vale la pena fare un salto a Greenwich per i suoi importanti musei, il suo mercatino, le viste sui Docklands, per i negozietti unici e caffè carinissimi, in uno dei quali insieme al caffè vi danno anche l'occorrente per dipingere la vostra tazzina o il vostro mug. Ma il mio luogo preferito è senz'altro il Parco al quale ci si può anche arrivare in barca dal Tamigi, dove si ha una magnifica vista su tutto il villaggio, sullo splendore dei suoi musei e sui Docks sapendo di essere in un posto unico al mondo: il meridiano 0. 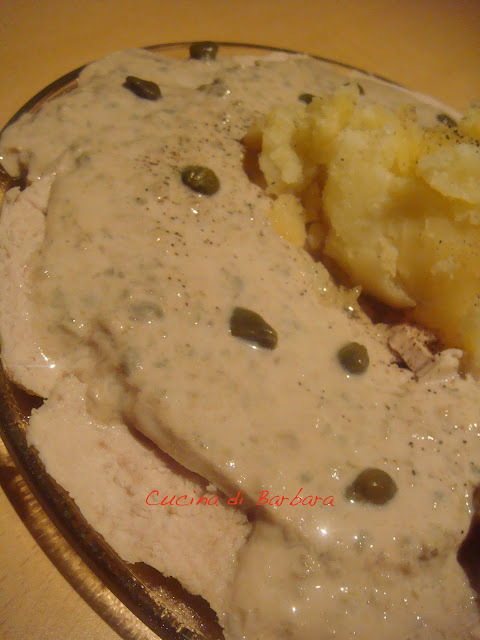 Ed ecco quindi, carissime amiche, una ricetta che possiede tutti i colori caldi ed unici di questo momento: cosce d'anatra alla melagrana. Inizio frullando il succo di una melagrana, tenendo da parte qualche "rubino" da utilizzare per guarnire. Scaldo una padella con del ramerino, aglio in camicia e semi di finocchio. Nel frattempo appiattisco le cosce schiacciandole e pratico col coltello delle incisioni sulla pelle, che permetteranno al condimento di insaporire meglio le carni. Le aromatizzo con un misto di sale grosso, sale, ramerino, timo e salvia. Le passo in padella a fuoco alto per circa 10 minuti, girandole. 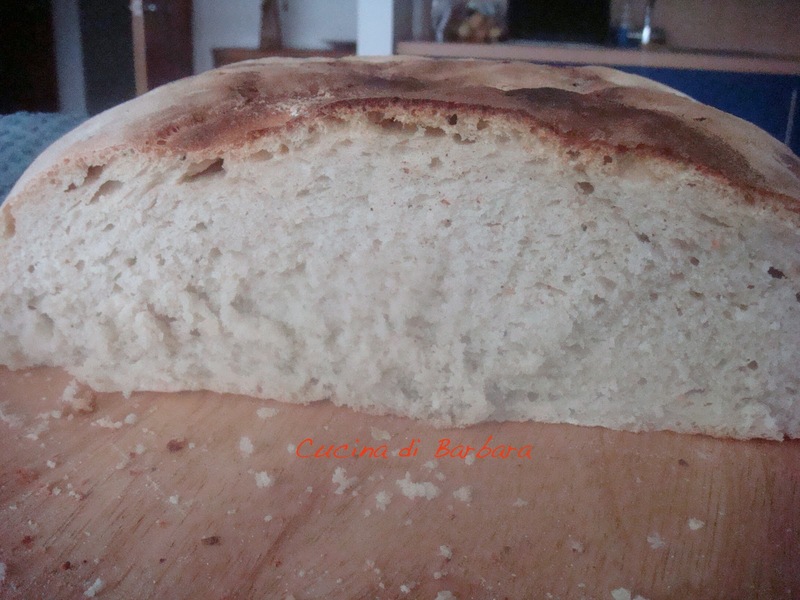 Poi le passo al forno insieme al succo di melagrana, per completare la cottura dell'interno a circa 180°C per 20 minuti. Ed eccole pronte croccanti esternamente e tenere dentro. Impiatto ed accompagno con delle carote glassate, per ottenere così un piatto con tutti i colori ambrati dell'autunno. When the weather starts to get colder, and here in London it's starting, I begin to think about the hot vegetable soups: the "Minestrone" as we call it in Italy. 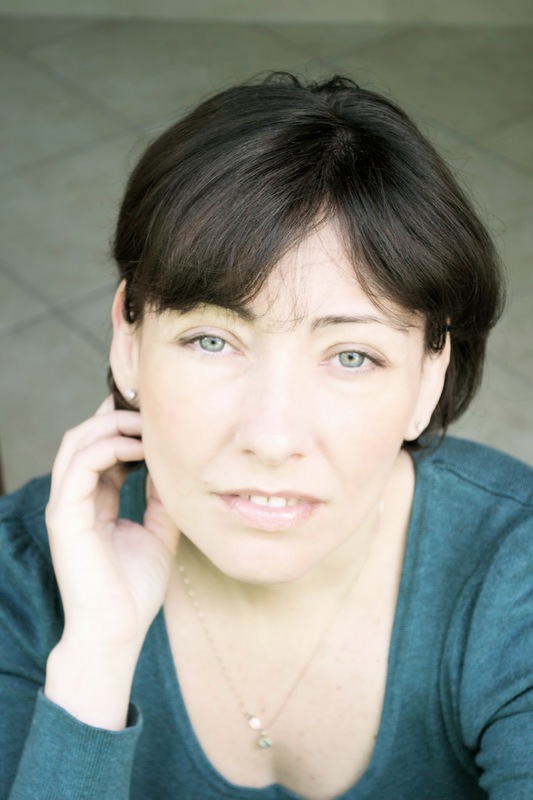 There's a little problem: my husband hates them! So, if I want to do them I always have to play little tricks, like waiting when he's not feeling well or put his attention on something which is not veg. In this case on sauteed prawns. I'm adding a little extra in this post: I'm attaching some pictures of my preferred local street market, where I use to buy fantastic fruit and vegetables. The funny thing is that they don't weight the goods, but they sell them on trays, from 50p to a maximum of £ 2, but with an average of £ 1 per tray. You choose the tray, give them a little coin and go home to make your soup! Next time I'll post more info about my area: The Borough of Greenwich. In a pot at low heat add 1 table spoon of olive oil and 1 table spoon of flour, stir and than add all the sliced vegetables. After that add the vegetable stock, cover and cook for half an hour, check and stir occasionally. Add the mint leaves and blend. Now in a small pan add some olive oil and cook the prawns for two minutes on each side. Serve in bowl with grated ginger and mint, add the prawns on top and a drizzle of olive oil. Però esiste un grande però: mio marito le odia...quindi devo sempre escogitare qualche trucchetto. 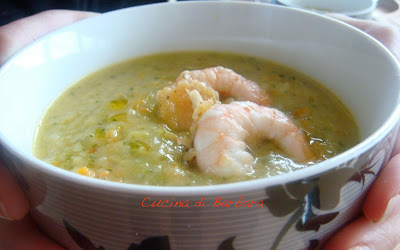 Un mal di gola, verdure inutilizzabili crude o comunque guarnirle come questo semplice minestrone passato, con un paio di gamberi saltati in padella. Piccolo piccolo extra. Allego anche qualche foto del mio piccolo mercatino di fiducia locale che ogni giorno vende frutta e verdura fresca b-u-o-n-i-s-s-i-m-a! Per chi dice che Londra sia cara, lo è se si vive da turisti. La prossima volta qualche notizia sulla mia area: The Borough of Greenwich. In una pentola metto un filo d'olio e un cucchiaio di farina, sciolgo ed aggiungo le verdure tagliate a rondelle. Dopo di che aggiungo il brodo e faccio andare a fuoco lento per 30 minuti. Di tanto in tanto controllo e giro, salo, aggiungo le foglie di menta e frullo con il minipimer ad immersione. Tengo in caldo la pentola. In un padellino con olio e aglio faccio saltare i gamberi due minuti per lato. Metto in una ciotola guarnisco con ginger fresco e gamberi. My Grandmother and Grandfather were from Apulia, so my cooking is also influenced by the old recipes from this part of Southern Italy. When I feel nostalgic I use to make some recipes which I used to prepare together with my Grandma Angelina. I still remember her, with her little chair, setting up her old wooden working board in front of the window to get a better light. And then my turn was coming. She used to say:"Check that I don't have any hair on myself" and then "tie my headscarf, I don't want any hair falling in the dough!" and again "tie the apron!". I was so excited!! Then I had to go to wash my hands, first with soap and than rinse them countless of times to avoid the scent of the soap to "contaminate" the dough. She was so funny! After all this ritual we could finally start to play. We kept calling the panzerotti "lè pettl" even if it wasn't the correct name, because it was so funny for all of us children and always made us lough so much! Put 400 gr. 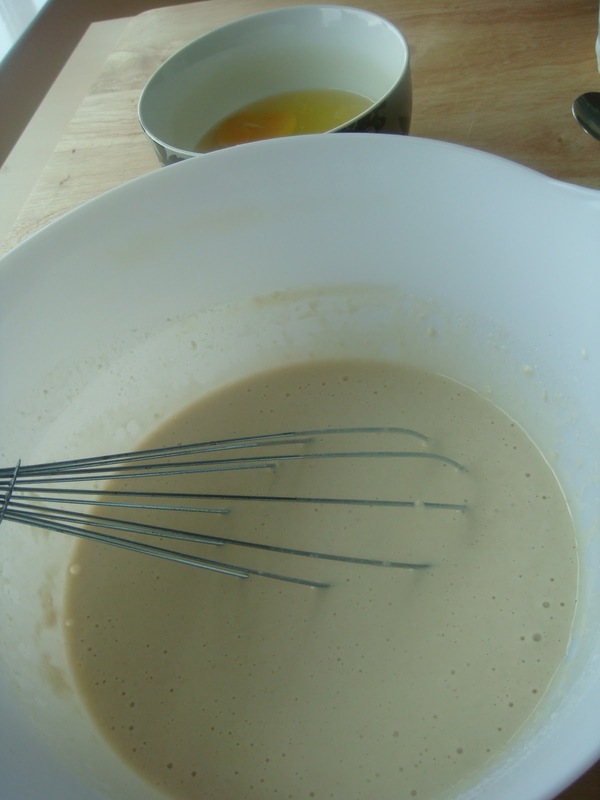 of plain flour in a large bowl, considering that the dough will rise of more than the double of its initial volume. Dissolve the yeast in the warm water and add it to the flour. Work the dough a little bit until the water with the yeast is completely absorbed. Start working the dough vigorously for 10 minutes, until you get a smooth mixture. In order to be ready, the mixture must be compact, homogeneous and not sticky. and cover it again. Repeat the whole thing after another hour. Cover and rest. When it has doubled its volume, the dough is ready! top you will have previously dirty with some flour. get a perfect round base. Work it on both sides. 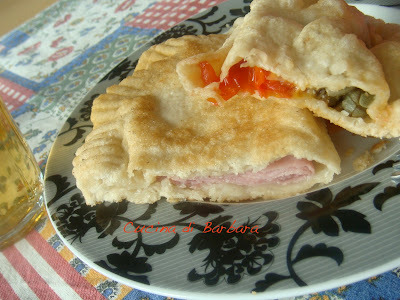 my favourite filling is : some little cherry tomatoes, cooked ham and cheese. Another idea could be: cherry tomatoes, capers, anchovies, green olives, oregano and cheese. Of course you can fill them with your preferred ingredients. Preaheat a pan with a large dose of seed oil and when it is frying cook the first panzerotto, 5 minutes on one side and 4 minutes on the other one. Add a pinch of salt and serve straight away. 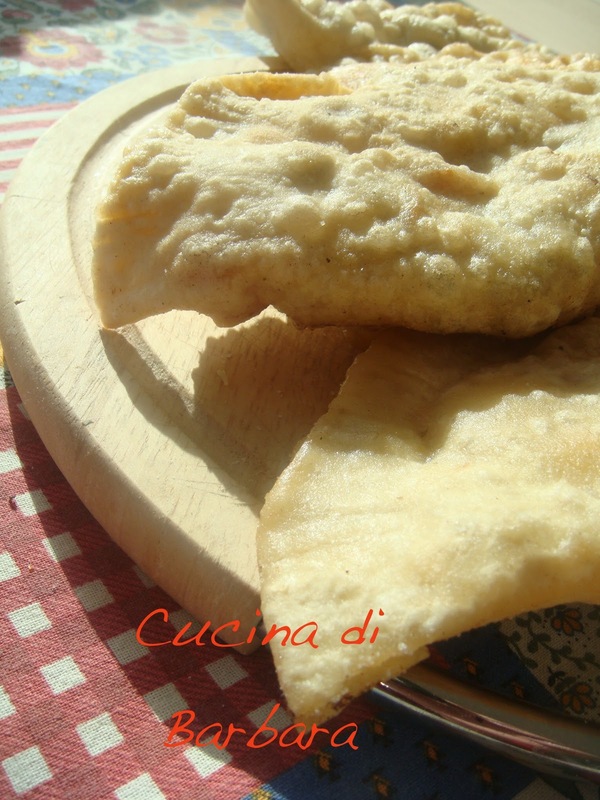 I miei nonni sono tutti pugliesi, per cui la mia cucina è molto influenzata dalla cultura del cibo pugliese, anzi "sudista" come dico io. Per cui quando sento un po' di nostalgia provo a ricreare le vecchie ricette della mia nonna Angelina. Io me la ricordo ancora, con quella "siggtèdd" (seggiolina) di paglia, metteva il suo vecchio pianale di legno accanto alla finestra e spostava le tende perchè la luce doveva essere quella. Fate la fontana nel mezzo e mettete il lievito sciolto nell' acqua appena tiepida, iniziate a lavorare, con le mani. Lavorate fino a che non avrete un composto omogeneo e abbastanza solido, saranno sufficienti non più di dieci minuti. Coprite l'impasto con panno e mettetelo nel forno ovviamente spento. Lasciate riposare e quando avrà raddoppiato il suo volume è pronta, circa 1.30\ 2 ore. Se però avete il tempo, per ottenere un miglior impasto fate così: lasciare riposare per 1 ora, rimescolare l'impasto che si sgonfierà perdendo il volume. Lasciare ancora riposare per un ora e ripetere l'operazione. Otterrete un impasto meglio lievitato e più digeribile. Trascorso questo tempo, prendete una parte dell'impasto, grande come un pugno ed infarinate il tavolo da lavoro. Con l'aiuto di un mattarello stendete la pasta, prima da un lato e poi dall'altro, cercando di stenderla in tutte le direzioni come per fare delle pizze più piccole. Farcitele da un lato come preferite: prosciutto cotto, formaggio e pomodorini ciliegia (queste erano le classiche della nonna) oppure con scamorza, olive, capperi, cipolla e alici (stuzzicano). Chiudete i bordi aiutandovi con i rebbi della forchetta e in una padella metttete abbondante olio, quando ben caldo iniziate a friggerle, 5 minuti da un lato e 4 dall'altro in pizzico di sale sulla pasta ed addentate immediatamente queste pettl! These days I'm up in Manchester because my husband has some concert to play and I'm doing a lot of sight seeing. It's no longer that old industrial city and is actually quite young and vibrant. I'm enjoying it a lot, as I've enjoyed the best curry I had in England so far, yesterday night in a lovely little restaurant! My today's recipe has nothing to do with curry and is a well known north Italian recipe. The original recipe is made with a lot of mayonnaise, which makes it tasty, but not very healthy. Now it's time to prepare the souce. Put in a food processor a jar of greek yogurth (250 gr. 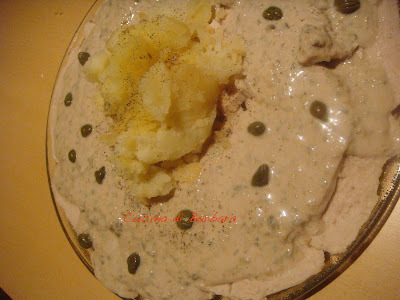 ), 2 table spoon of capers, 2 anchovies, a jar (100gr.) 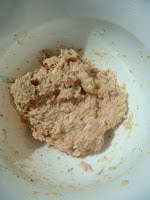 of tuna, some drops of aceto balsamico and mix altoghether. Taste and if needed add a bit of salt. After that, take the turkey out of the pot and keep it wrapped for 10 minutes in aluminum foil. Cut the turkey in slices and place them in a big plate and sprinkle with the cream. I've used the potato I've boiled before as a side dish. In questi giorni sono a Manchester per seguire dei concerti di mio marito e ne approfitto per visitare questa interessante città inglese, non più solo una vecchia città industriale, ma una città vibrante e giovane, basata sulla cultura, sugli eventi, proprio adesso c'è l' interessantissimo Food Festival. La ricetta di oggi è una ricetta che ho visto a Cotto e Mangiato ed è buonissima, veloce e se ne può mangiare a cucchiaiate perchè non c'è maionese! In una pentola metti a cuocere per 45 minuti il tacchino con tutti gli odori (così poi avrai anche un buon brodo per il giorno dopo). Nel frattempo nel mixer metti lo yogurt, il tonno, le 2 acciughe, qualche goccia di buon aceto balsamico, mixa per qualche secondo fino a che non otterrai una bella cremina. Assaggia ed eventualmente aggiusta di sale e pepe. Quando la carne è pronta tienila una decina di minuti avvolta nella stagnola, poi affettala, sistemala nel piatto di portata e cospargila di salsina. Bread. 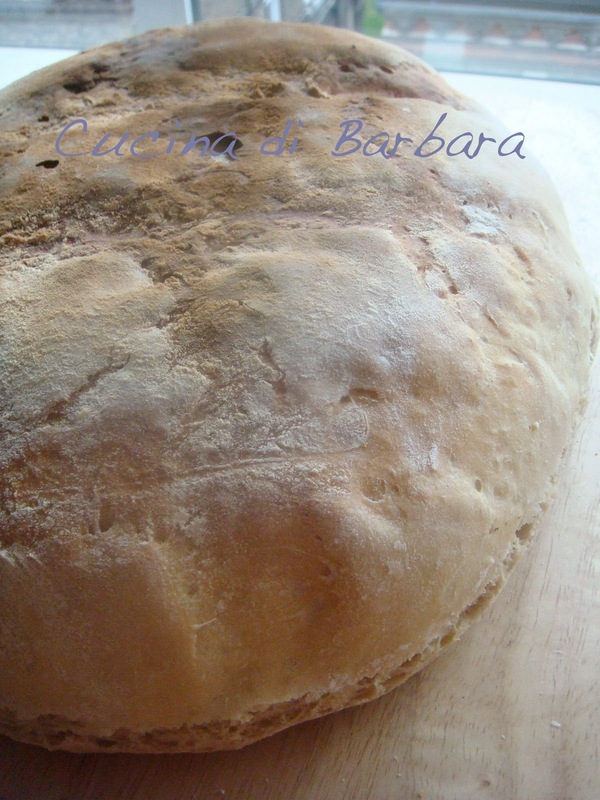 This is the Bozza Pratese, which is the typical unsalted loaf from Prato, my city in Tuscany. This loaf will last around 5 days and will taste better starting from its second day!! I was looking for it to prepare some classic tuscan dishes, such the "pappa al pomodoro", "fett'unta", "minestra di pane" and of course the "panzanella". Unfortunately I couldn't find it in London, so I decided to bake it by myself! I read a lot of blogs about baking your own bread and I found them terribly difficult to understand, so I've tried to remember what my Grandmother told me when I was a child and she used to tell me how she made it. So this is what and how I've done it. 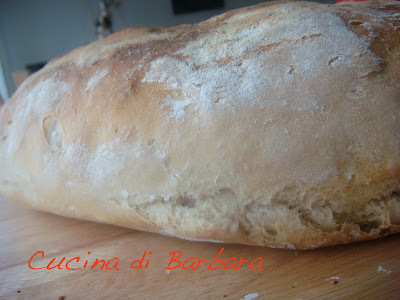 I coudn't prepare any of my favourite dishes, because the bread was finished after 2 days only!! 1) In a large bowl put 270 gr. of flour. 2) In an another bowl put 5 gr. of yeast into 1\2 pint of warm water. Add it to the flour and start to work. Work it very quickly but gently for 5 minutes circa, until you get a nice ball shaped dough. Cover it and rest for 18 hours. Take the dough and cut it in small pieces. Now repeat the passages 1) and 2) and whilst you add the watre, also add the small dough pieces. Work the new dough until you reach an homogeneous texure and give it a rectangular shape. Fold it like pictured, sprinkle with flour and rest for a hour and half. The whole procedure was done on a wooden chopping board sprinkled all over with flour. After that, give it the shape you want and do some cuts with the knife and let it raise again for another hour. Pre-heat the oven at 250°C, leave inside the oven tray you'll use for the bread. It needs to be really hot when you'll lay the bread. Put an oven pot filled with water on the bottom of the oven, because the bread needs humidity whilst baking. Bake the bread and after 10 minutes remove the tray with the water and set the temperature at 190°C for circa 30 minutes. When it is ready rest it for 15 minutes and cover the loaf with a tea towel, it will loose its humidity. Now it's ready! 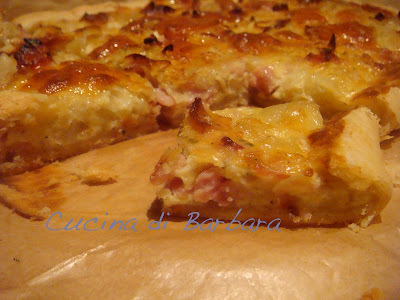 My suggestion is to eat it with Salame Toscano or Prosciutto di Parma. Hello again my dear Friends! 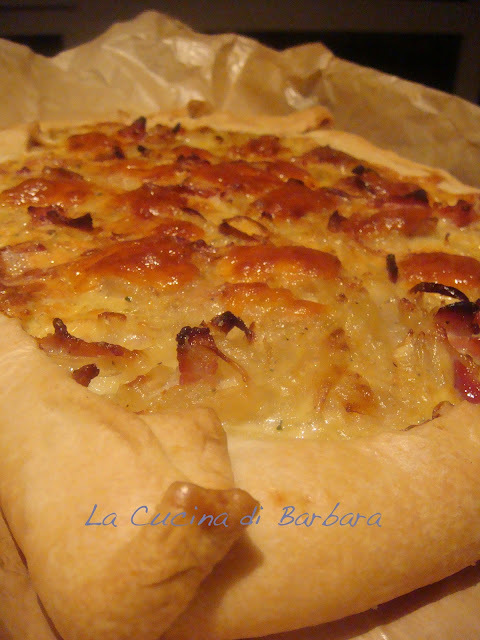 My today's recipe is an Onion & Bacon Quiche. In my opinion this kind of recipe shouldn't have so much indications about ingredients and doses, but suggestions only. Everything must depend by your personal taste and by what you have in the kitchen. 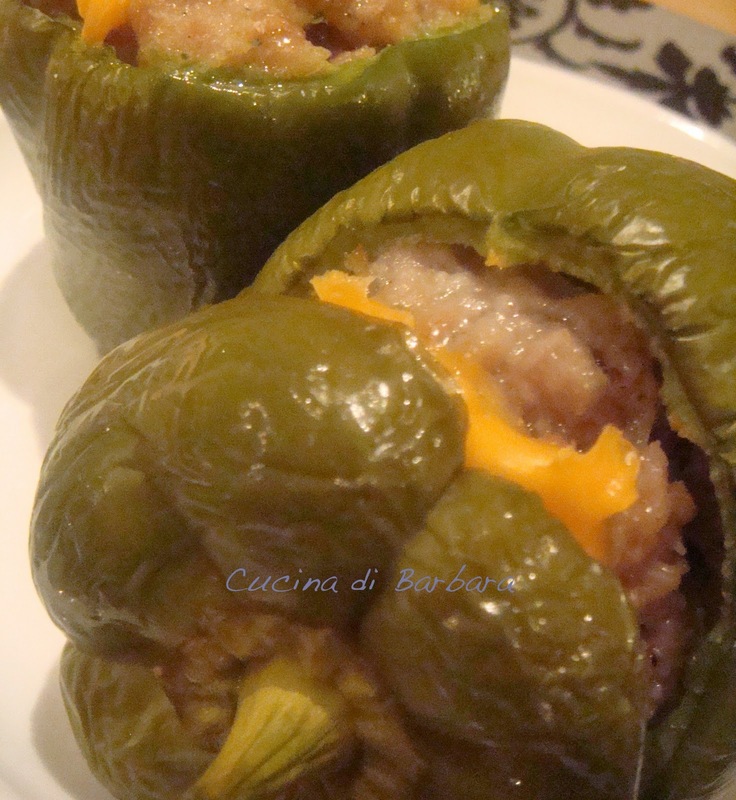 They are delicious with cheeses, vegetables, ham, fish, meet, etc. There's quite nothing so versatile. 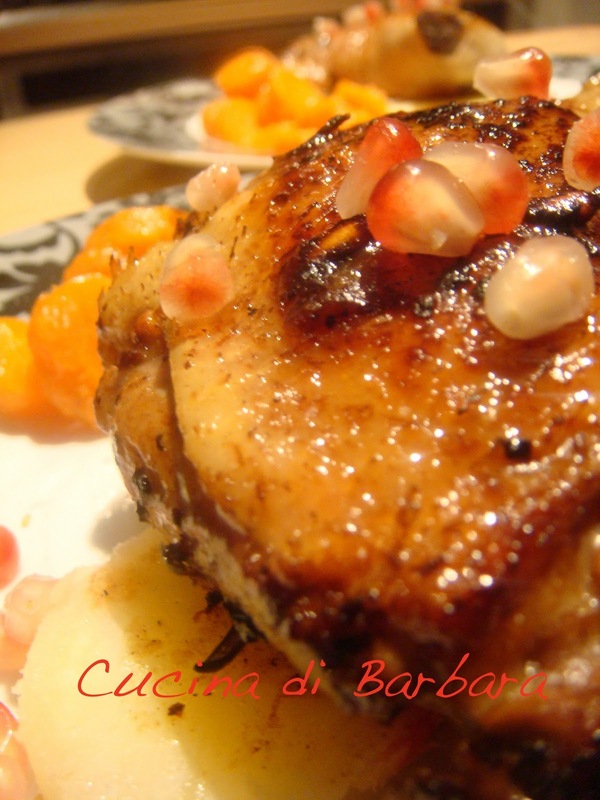 You can also use it as a starter, for an aperitivo or as a main dish, like my husband and me we usually have. This Onion & Bacon version is so delicate... Enjoy! Cut in slices the onion and place them in a large soucepan with the bacon in cubes, at medium flame. In this way you won't need to add other fat or oil. 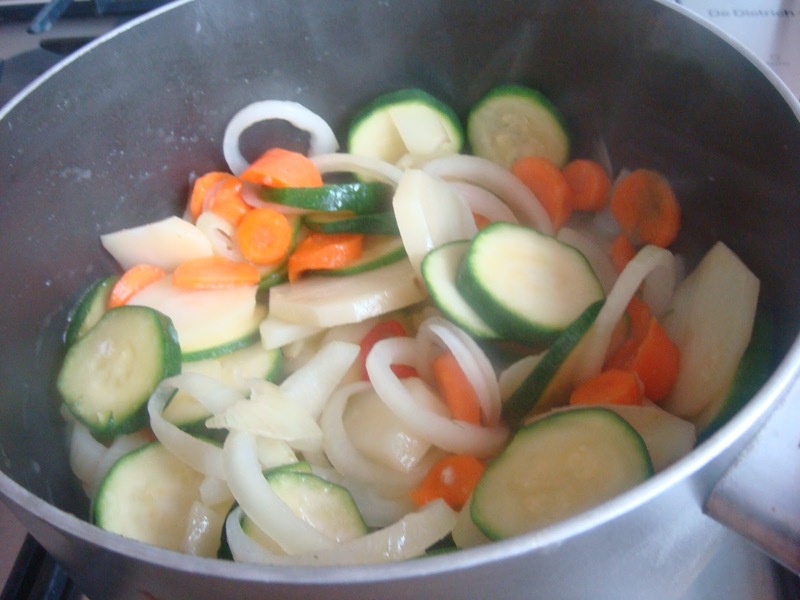 After some minutes, simmer until the onion will become soft and glossy, if needed add a ladle of warm water. In the meantime combine in a bowl the eggs, milk, parmesan, salt, pepper, thyme. Cover an oven tray's bottom with baking paper and place the pastry on top. Sting the pastry with a fork and if you want add some grated cheese. Put the onion and bacon inside the pastry and then the eggs mixture, onother sprinkle of grated parmesan and some piece of edam cheese. That's it. Bake it for ca. 30 minutes. You can have it warm, hot or cold... it's delicious in every way! Le torte salate non dovrebbero indicare dosi e ingredienti, ma solo suggerimenti, in quanto devono dipendere esclusivamente dal gusto "della casa" e dalla disponibilità della cucina. Sono ottime con formaggi, funghi, affettati, pesce, carne, verdure... niente di più versatile. In più risolve facilmente antipasti, aperitivi e qualche volta come succede a me e mio marito proprio la cena! Il risultato è un gusto delicato che conquista. Prendi un' ampia padella e fai sfumare le cipolle tagliate a fette, insieme al bacon, così non hai bisogno di ulteriori oli. Dopo i primi minuti abbassa la fiamma, copri e lascia cuocere fino a che le cipolle non siano diventate morbide, morbide. Se serve aggiungi un mestolo d'acqua. Alla fine aggiungi un poco di sale. Nel frattempo in una terrina sbatti le uova, con sale, pepe, parmigiano reggiano grattugiato, del timo e mezzo bicchiere di latte. Pre-riscalda il forno a 180°C, fodera la teglia con della carta da forno e stendi la pasta bucherellandola qua e la con la forchetta. Aggiungi le cipolle e sopra il composto di uova, spolverizza con altro parmigiano e pezzetti di Edamer. Inforna per circa 30 minuti. Ottima calda, tiepida, o ancora meglio dopo qualche ora, quando tutti gli ingredienti si sono "assestati". Don't be intimidated by the Crepes, they are surprisingly easy to do! This recipe is really simple and can be used to do both sweet and salted Crepes. Don't worry if you don't have all the right tools like the "T" shaped spatula or the flat grill, a normal spatula and a pan will do the job! The first Crepe is usually terrible.... ! Trust yourself and keep going! In bowl mix togheter milk, flour and a little pinch of salt. Whisk until you get a smooth texture. Now add the beaten eggs, stirring to combine. 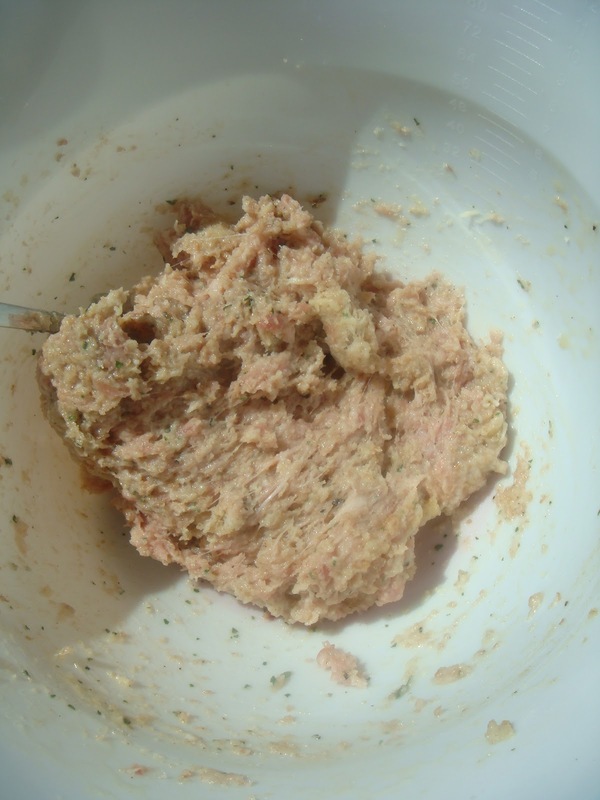 Place the mixture in the fridge for at least 30 minutes. Put some oil in a large pan and heat at high temperature. 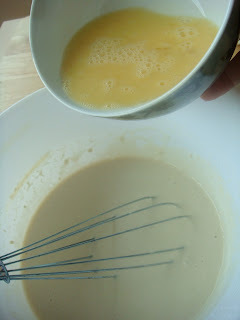 Take a ladle of mixture and put it in the pan and very quick tilt the pan from side to side, until the mixture covers all the bottom of pan and you get a thin layer to slide. In just two minuts the crepe's edge will brown, this is the time to turn it with the spatula and cook the other side. 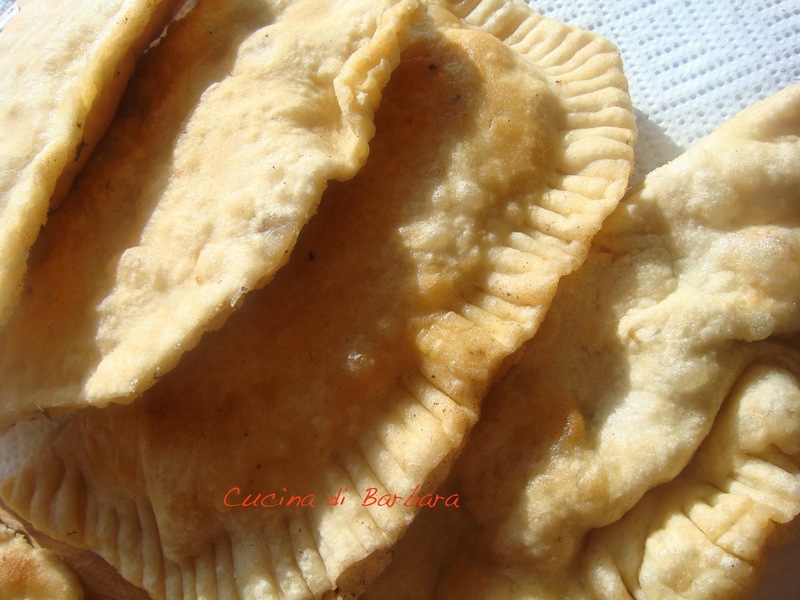 Non bisogna mai lasciarsi intimidire dal fatto che le ricette francesi siano talvolta sono complesse da realizzare. La ricetta delle crepes è molto semplice da preparare e può essere utilizzata sia per le crepes salate e sia per le golose crepes dolci. 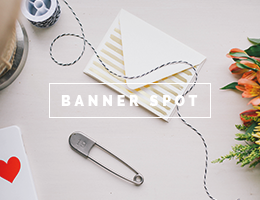 Non vi preoccupate se non avete gli attrezzi giusti come la spatola a T o l'apposita piastra, andranno benissimo una banalissima spatolina da cucina ed una semplice padella antiaderente. Piccola puntualizzazione: la prima crepe non viene mai bene! ... :) e con fiducia passate alla seconda! In una ciotola unite la farina setacciata con il latte ed un pizzichino di sale. Questo composto deve essere ben lavorato, io uso uno sbattitore elettrico od una frustina. Infine aggiungete le uova sbattute e lavorate ancora tutto insieme. Lasciate riposare il composto in frigorifero per una mezz' oretta almeno. Adesso mettete sul gas medio una padella antiaderente e quando è ben calda aggiungete un filo d' olio di semi. Prendete un mestolo di impasto e molto velocemente versatelo nella padella, che farete girare per far si che l'impasto si espanda fino a coprire tutto il fondo della padella e che la crepe diventi sottilissima. In un paio di minuti i bordi della crepe si scuriranno un po' e si staccheranno leggermente dal fondo. Infilate allora sotto lo crepe una spatolina e giratela, facendo cuocere così anche l'altro lato. Dopo un altro minuto saranno pronte. Le crepes sono sorprendentemente semplici da realizzare.